↑ Wu H, Wacker D, Mileni M, Katritch V, Han GW, Vardy E, Liu W, Thompson AA, Huang XP, Carroll FI, Mascarella SW, Westkaemper RB, Mosier PD, Roth BL, Cherezov V, Stevens RC (May 2012). 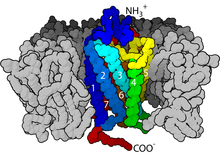 "Structure of the human κ-opioid receptor in complex with JDTic". Nature 485 (7398): 327–32. DOI:10.1038/nature10939. PMID 22437504. This page was last edited on १ अप्रिल २०१९, at ०३:००.